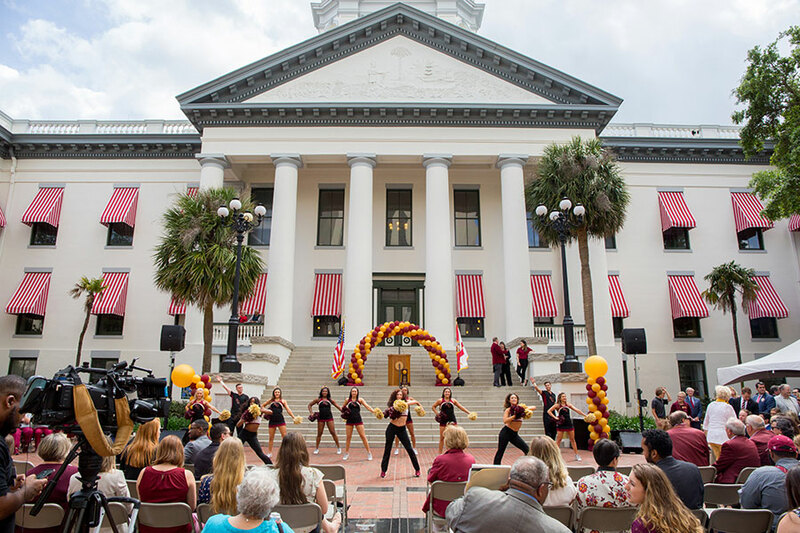 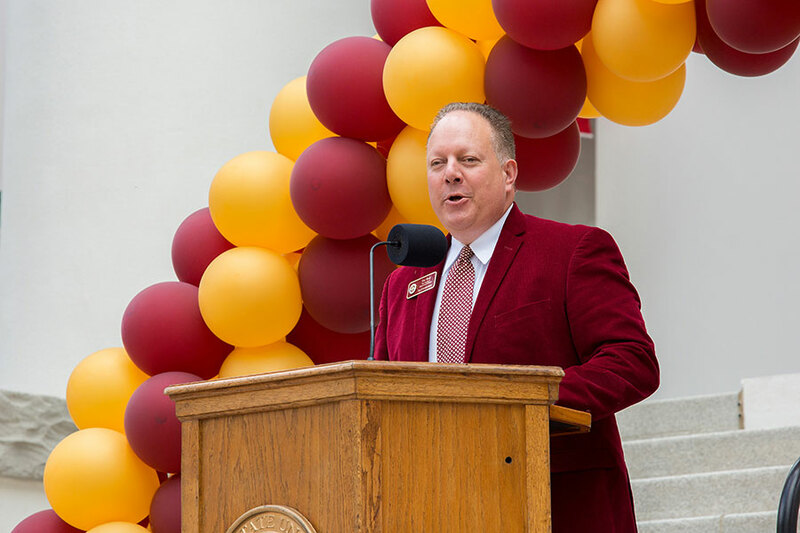 Garnet and gold adorned the Florida Capitol as hundreds of Florida State University supporters and legislators gathered to celebrate FSU Day at the Capitol Tuesday, April 9. 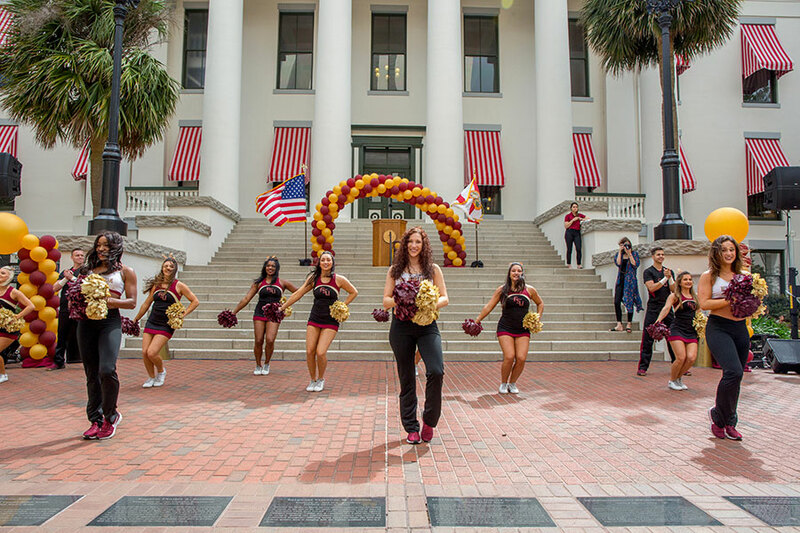 For more than 20 years, FSU Day at the Capitol has been an annual showcase highlighting Florida State’s academic and athletic achievements for the Tallahassee community and state lawmakers. 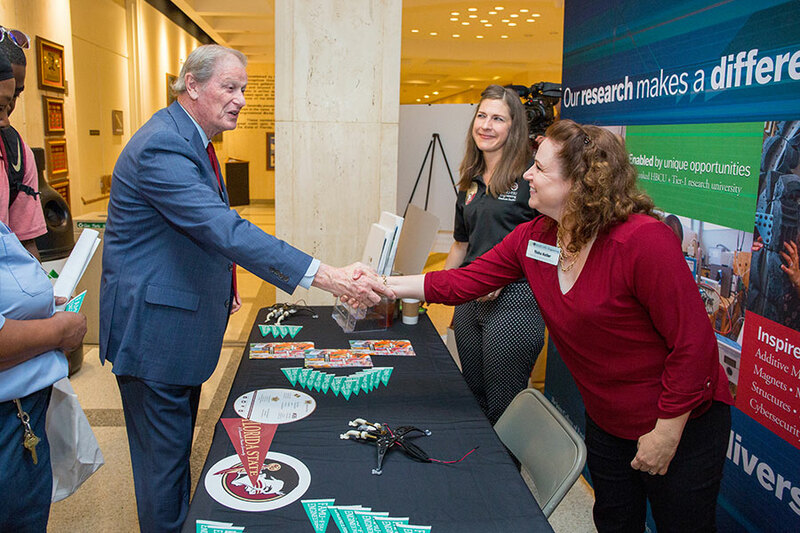 The Capitol rotunda featured booths from each college and an eclectic range of programs spotlighting FSU’s academic excellence. 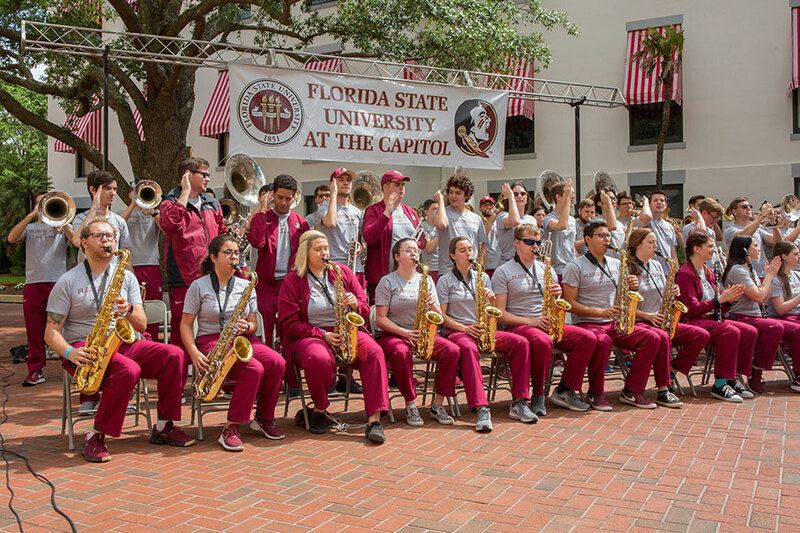 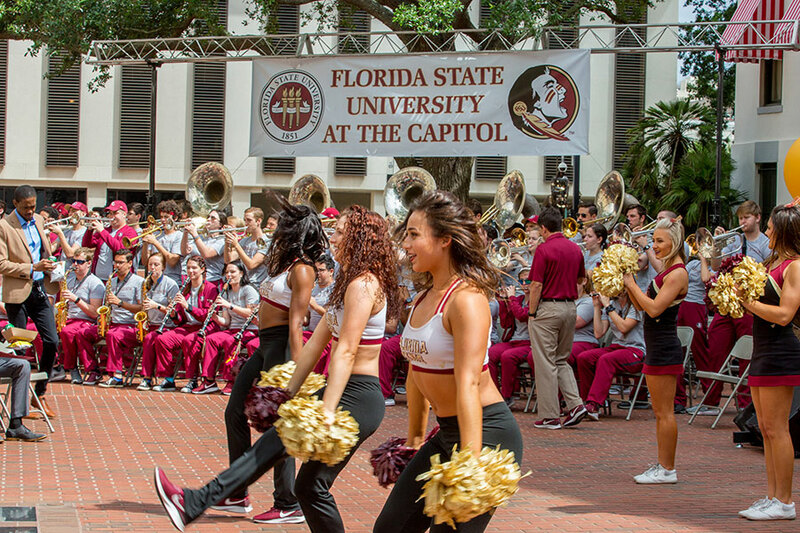 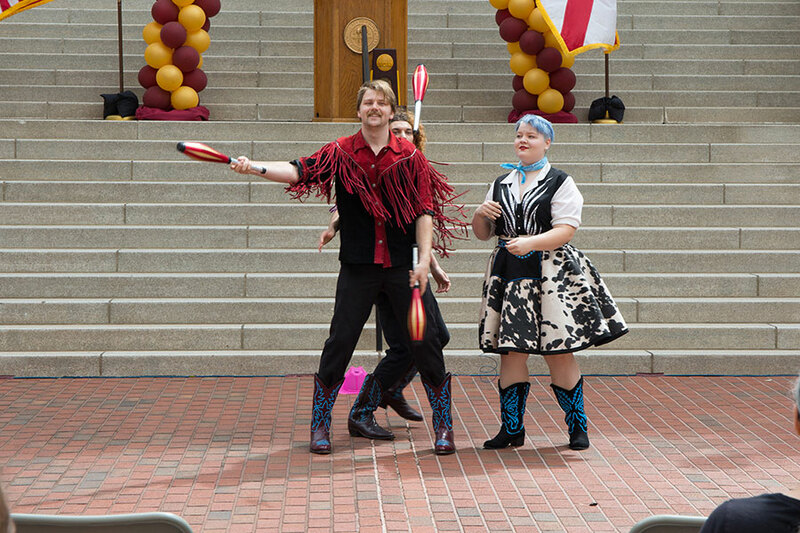 Outside, a pep rally took place in the Capitol courtyard, featuring music by the Seminole Sound and performances by the FSU cheerleaders, Golden Girls and FSU Flying High Circus. 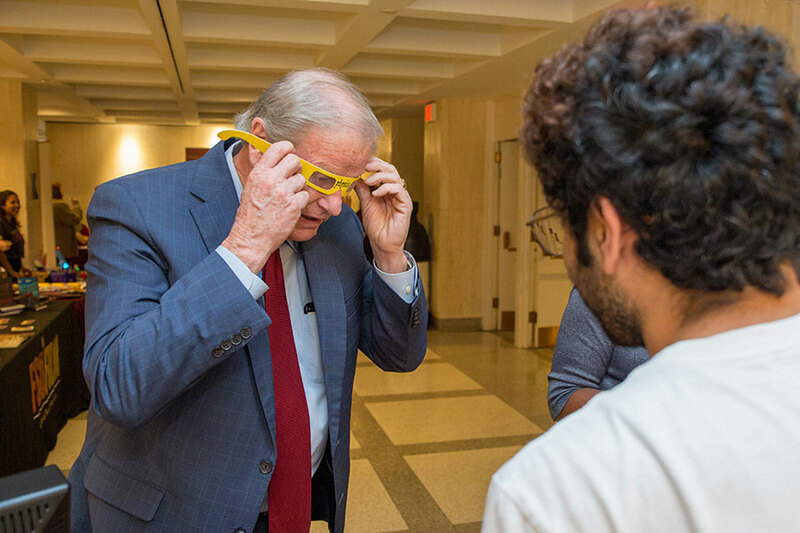 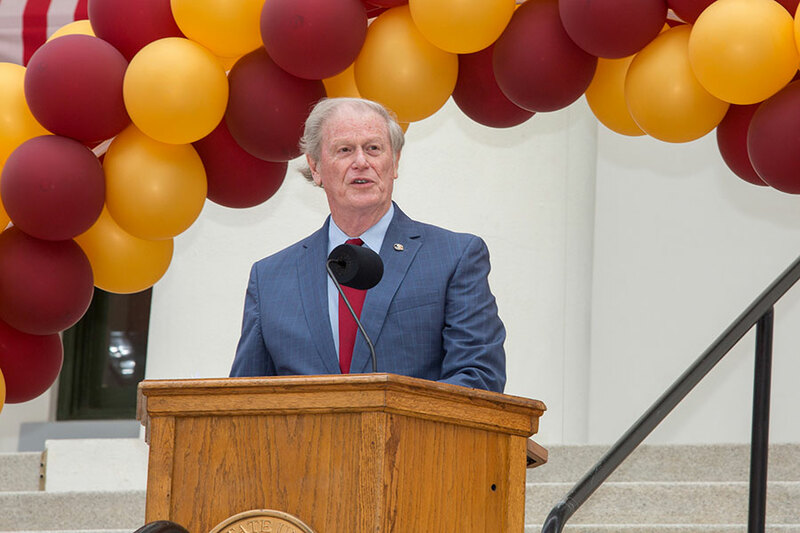 FSU President John Thrasher is no stranger to FSU Day at the Capitol, yet he still looks forward to it every year. 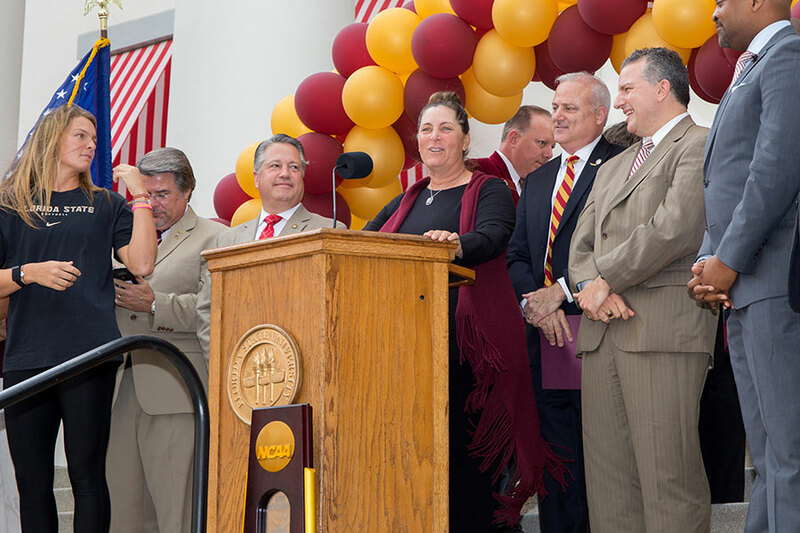 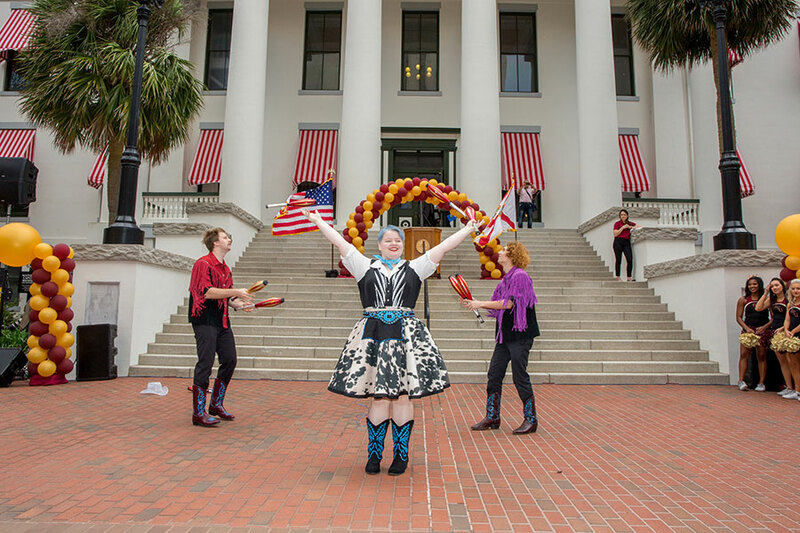 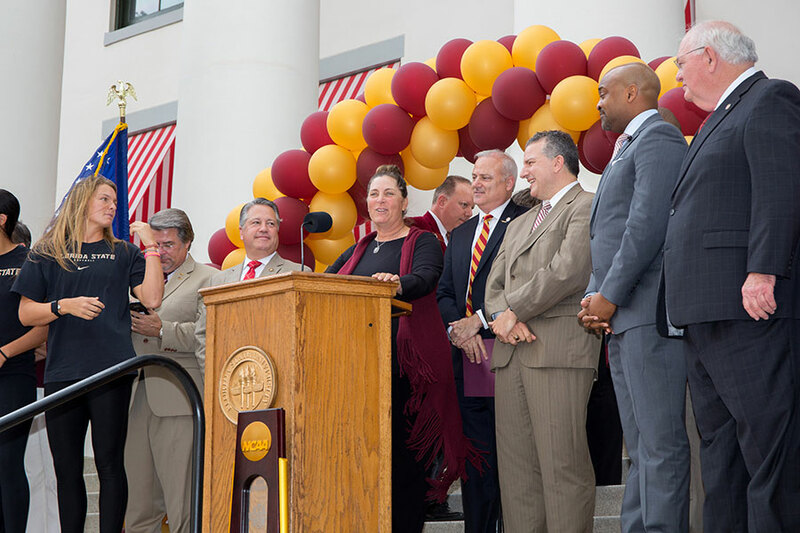 Members of the FSU community had much to celebrate at the Capitol this year. 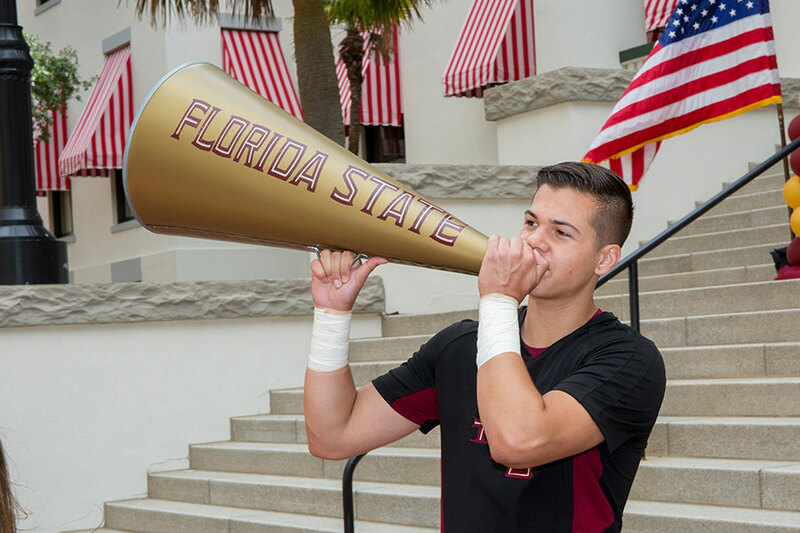 FSU was ranked the No. 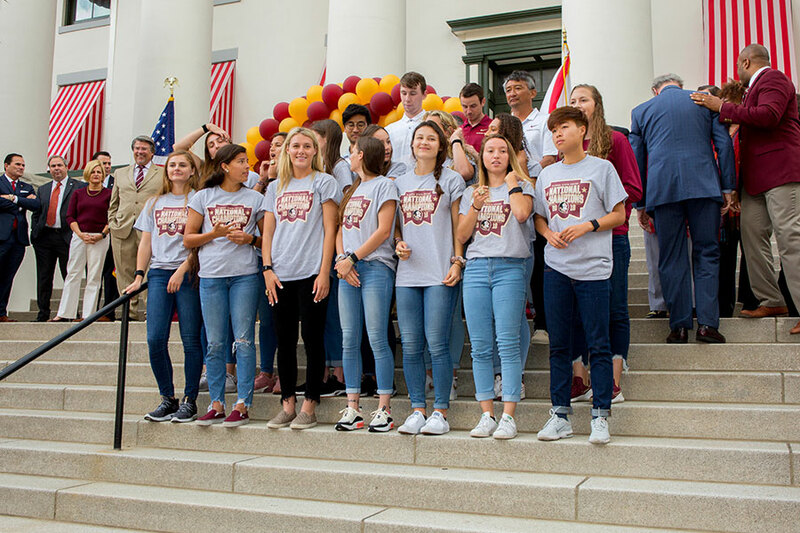 26 public university in the nation by U.S. News and World Report’s “Best Colleges 2019.” And, Florida State’s four-year graduation rate of 72 percent is No. 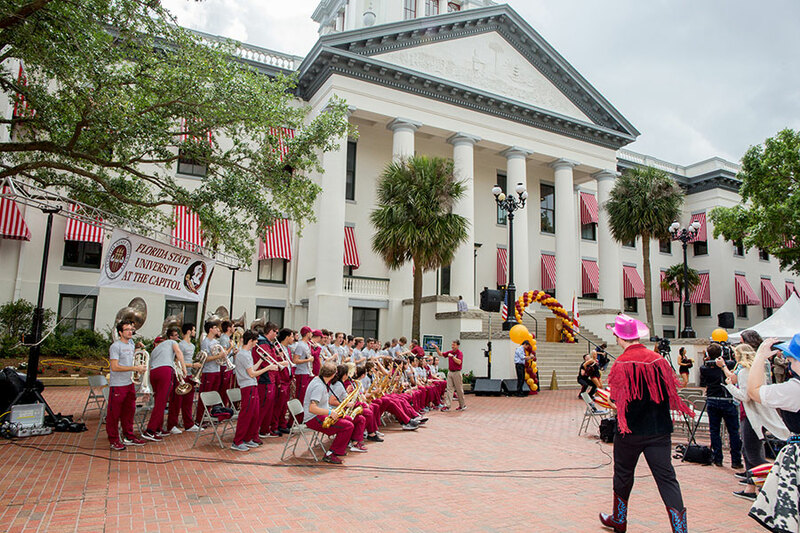 1 in the state of Florida and among the Top 10 in the nation. 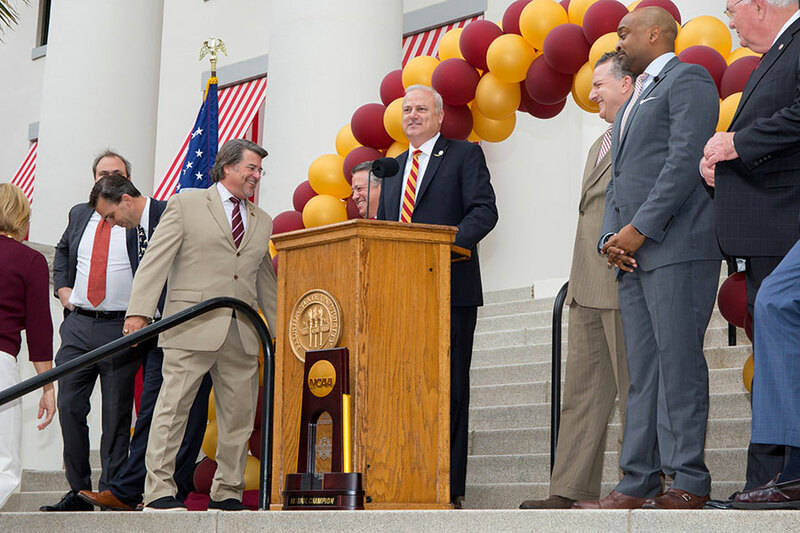 There was much to celebrate for FSU athletics as well. 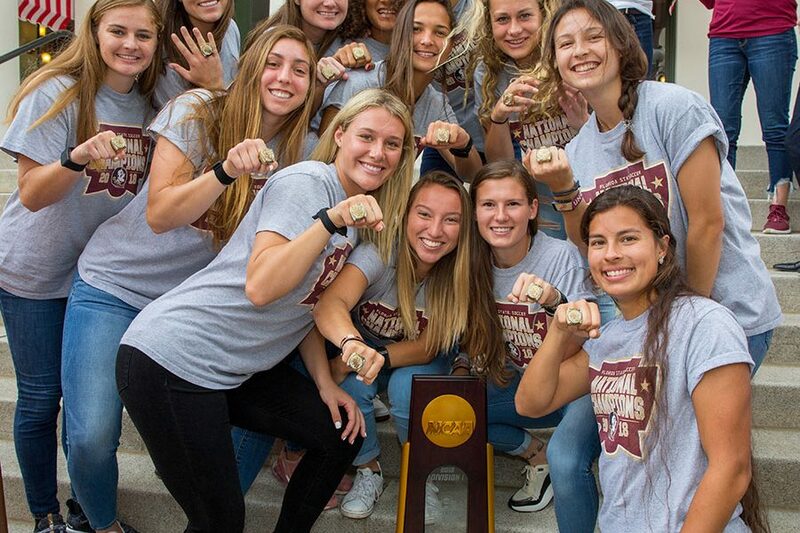 Both the FSU softball team and the FSU soccer team were honored for winning the 2018 NCAA championship titles in their respective sports. 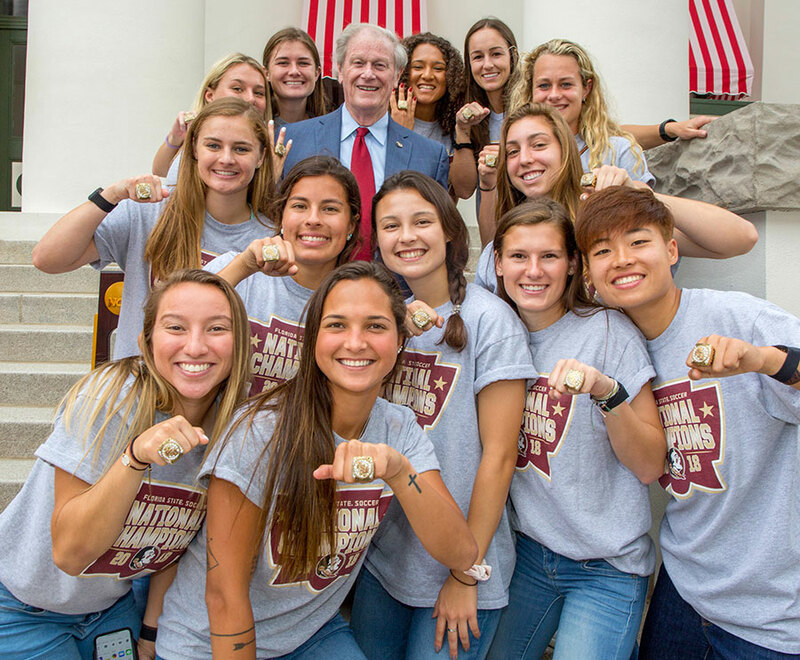 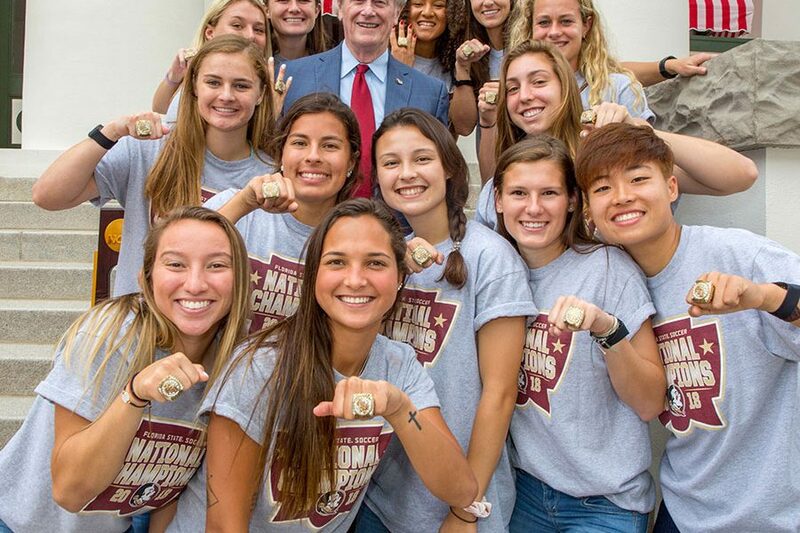 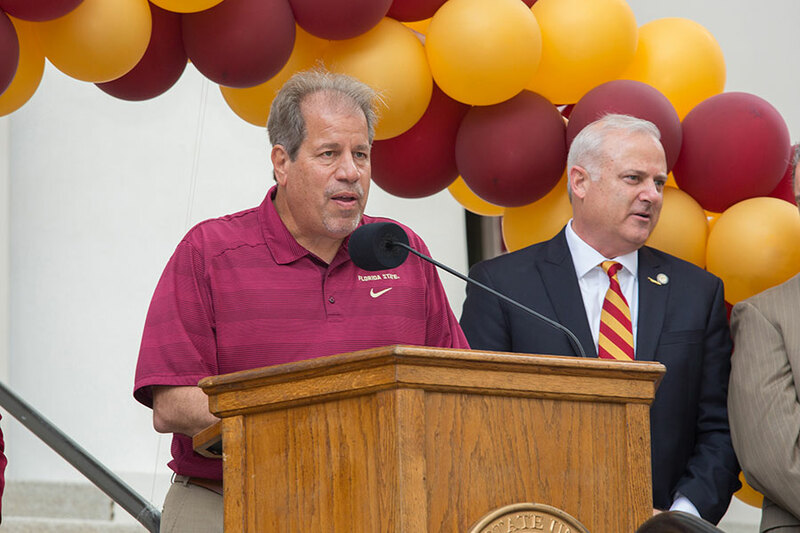 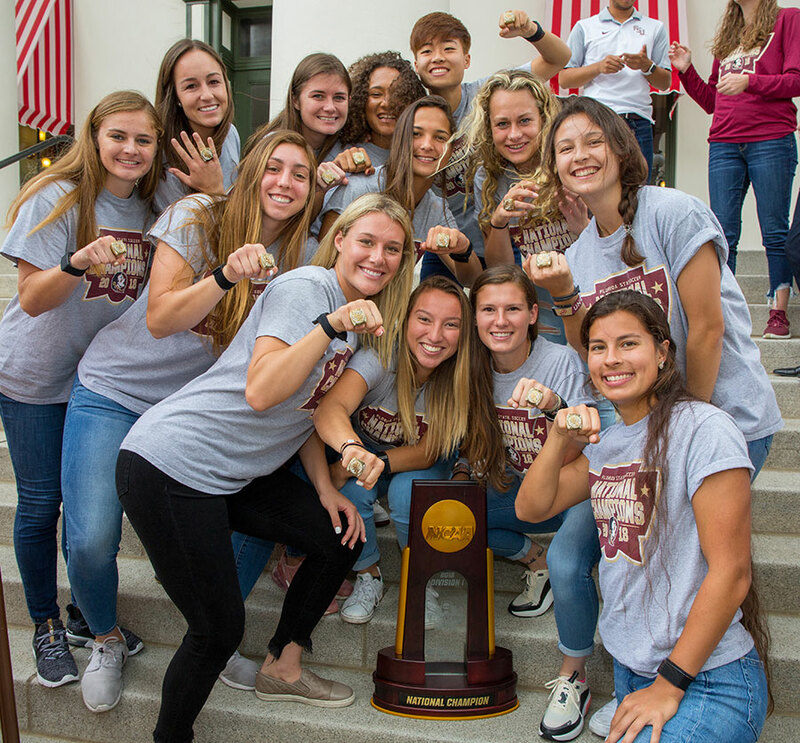 Thrasher presented the soccer team with their championship rings, and FSU soccer coach Mark Krikorian thanked the FSU community for their support. 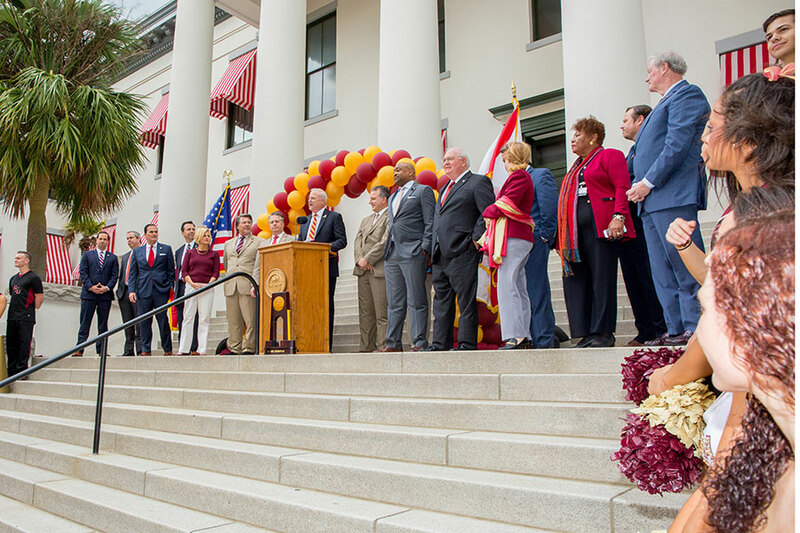 FSU alumni who currently serve in the Florida legislature also were acknowledged at the event. 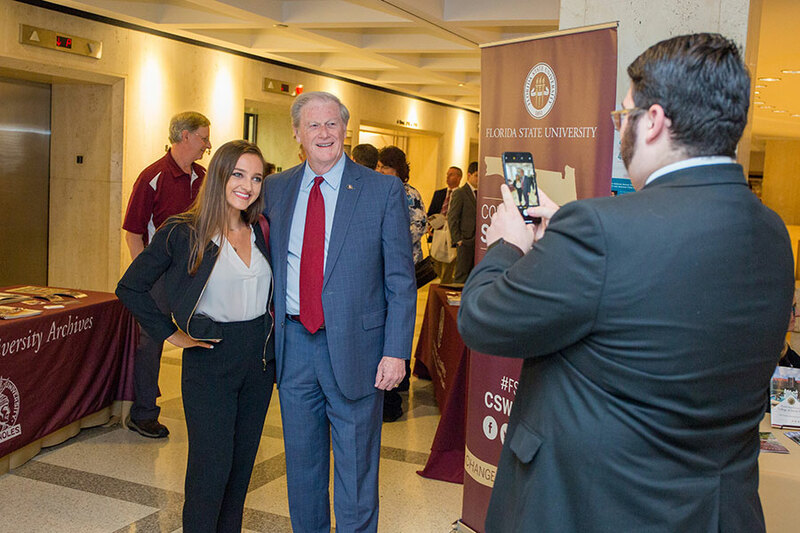 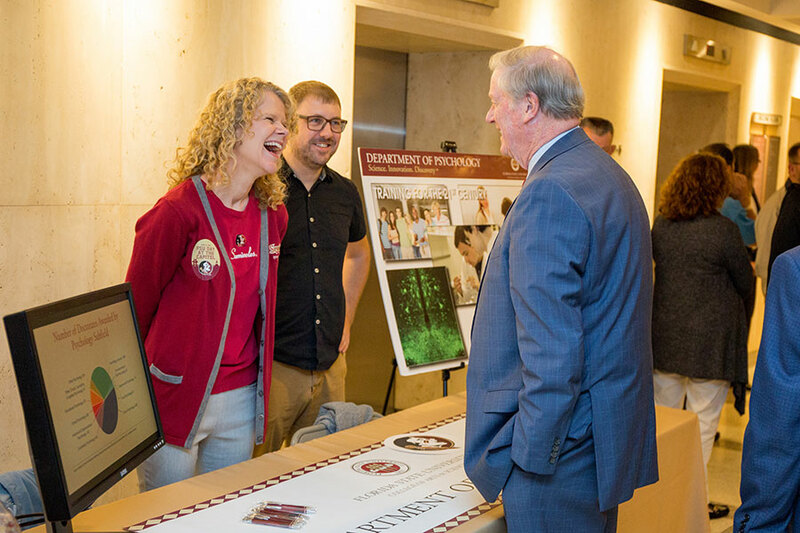 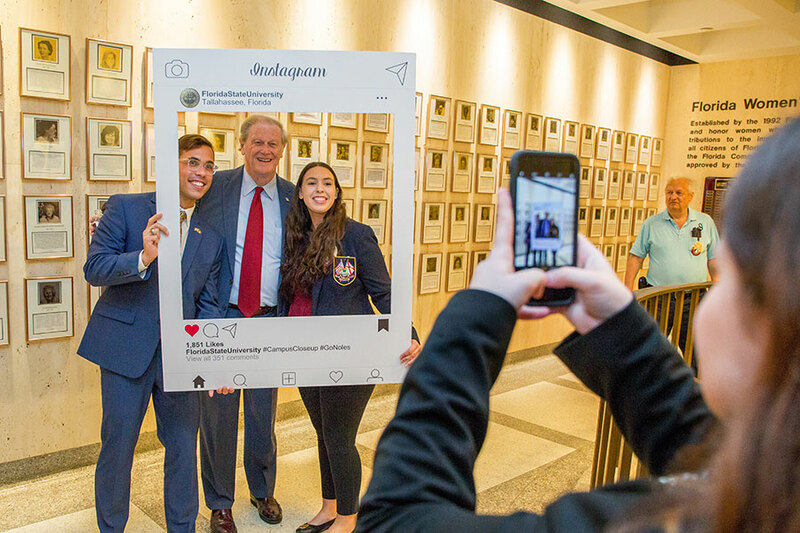 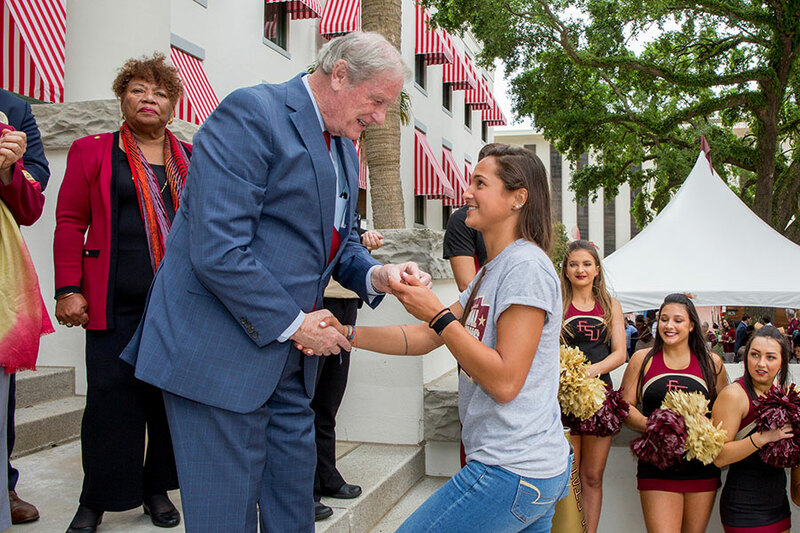 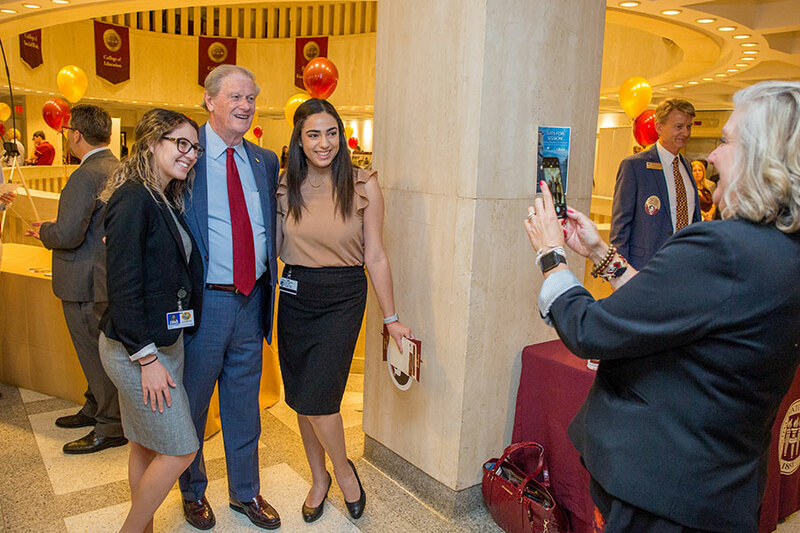 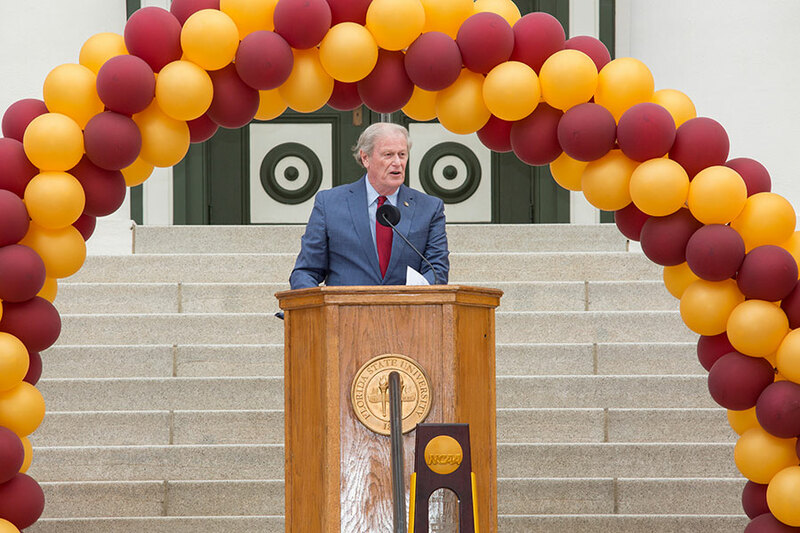 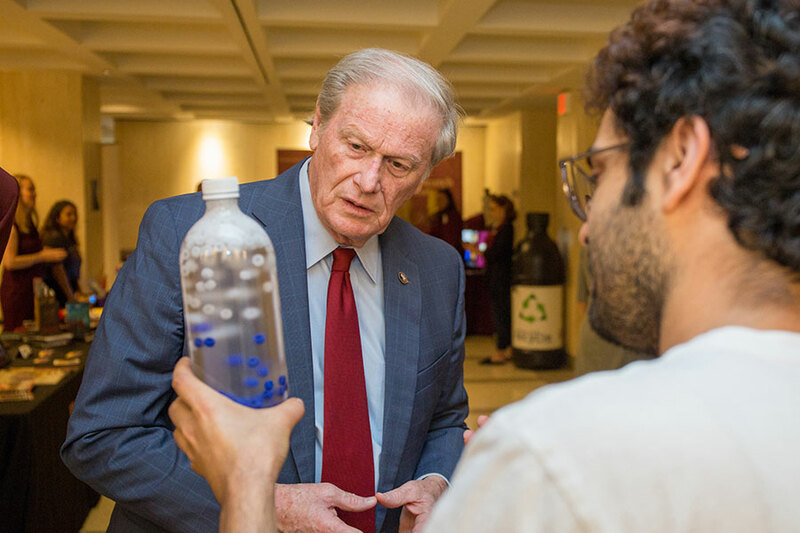 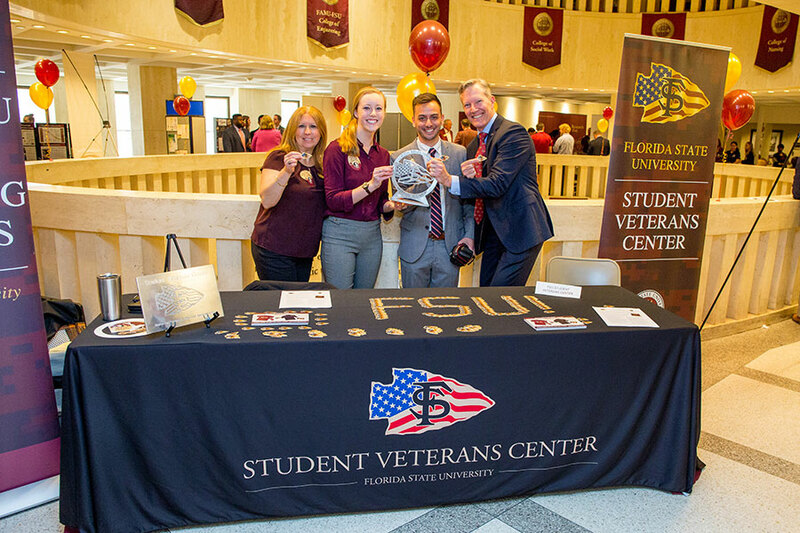 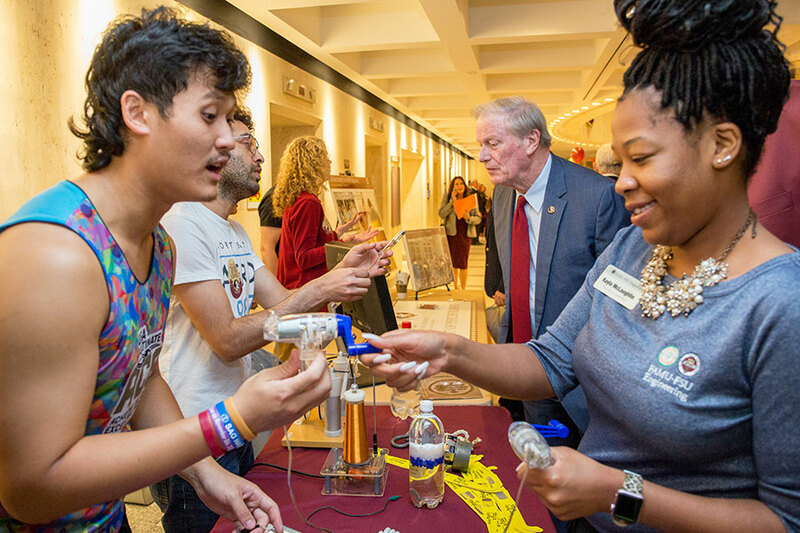 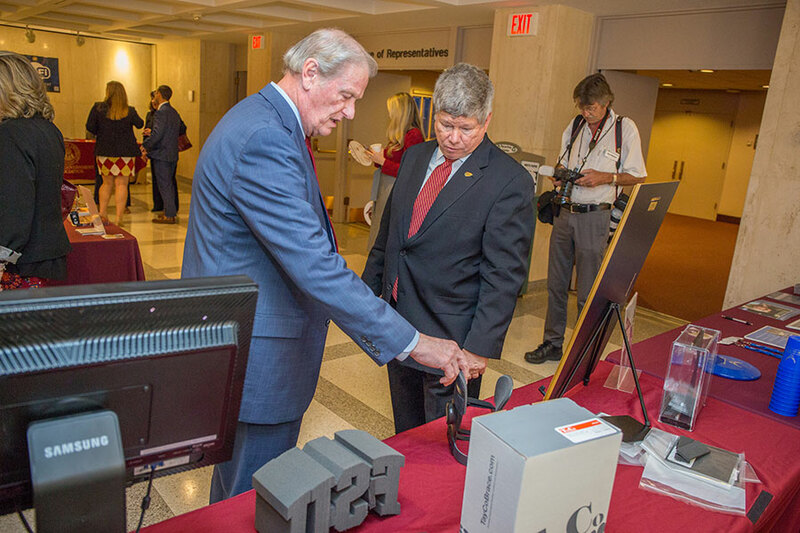 FSU Day serves as an opportunity for communication between FSU and the Florida legislature, a dialogue that President Thrasher believes is essential to the university’s success.